AfricanBioServices is an African-European scientific network working on the EU-funded project “Linking Biodiversity, Ecosystem Functions and Services in the Serengeti-Mara Region, East Africa: Drivers of Change, Causalities and Sustainable Management Strategies”. View all partners here. AfricanBioServices is coordinated by Professor Eivin Røskaft at the Norwegian University of Science and Technology, Trondheim, Norway. Contact the coordinator here. 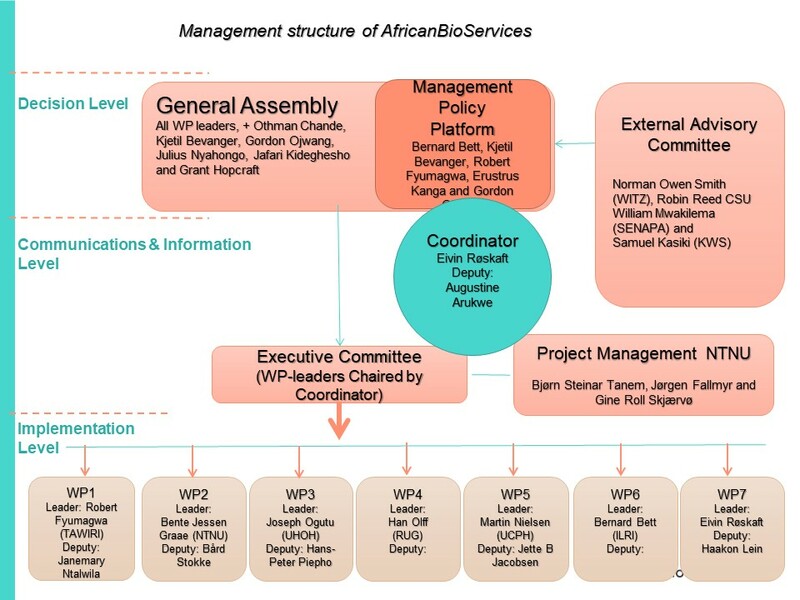 AfricanBioServices is organised into seven interlinked work packages (WPs). In WP1 we will assemble and integrate the relevant Kenyan and Tanzanian data for the region. In WP2, we will quantify the connections between human population growth, land use change and biodiversity changes. In WP3, we will analyse the consequences of climate change for key aspects of biodiversity in the region. In WP4, we will empirically test the links between biodiversity and the core ecosystem services on which people in the region depend. In WP5, we will quantify the dependence of human livelihoods on these ecosystem services. In WP6, we will initiate innovative ways for communicating and disseminating the results of the project through a forward-thinking strategy of ‘continuous engagement’ with local stakeholders that has a proven track record of success. WP7 encompasses the project management and aims at achieving the objectives and milestones in a timely manner and to the highest possible standards.